Recognize and Reduce the Risks in the water! How can you make your children SAFE in the water? You can’t. When it comes to water there’s no such thing as “safe.” If you look that word up in the dictionary, you’ll see it means free from risk of harm or danger. We can’t breathe underwater, which means there’s always going to be risk when we are in or around it. The first step is to recognize the risks around you. Then, there are steps you can take to reduce these risks and make your children SAFER in the water this summer! The Safer3 initiative, promoted by the Stop Drowning Now Water Safety Foundation, provides these useful tips for keeping your family safer in or around the water: You must have SAFER WATER, SAFER KIDS, AND SAFER RESPONSE! Any body of water creates a risk for drowning – whether it’s a pool, the ocean, or even a bathtub. In all cases, however, there are ways you can reduce the related risks. Experts recommend isolation fencing at least five feet high, equipped with self-closing and latching gates. It should completely surround your pool to prevent access, whether it’s from the house or from the yard. Homeowners should install sensors on doors or windows that exit to a pool area, so people are alerted if someone heads in that direction. Never prop the gate to your pool open. It may be tempting because the latches are difficult to operate, but this is exactly why they work in providing a good layer of protection. Install compliant drain covers in your pool and spa. If you’re an adult, get in the habit of assuming constant responsibility to supervise children around water. Kids must learn – as young as possible – swimming and basic safety skills. Teach your children to swim! Make sure you have enrolled your children in a lesson program that works with the whole child to make them safer in the water! Swim lessons at HOUSTON SWIM CLUB Swim School is a great place to start! Having a party or social gathering? Designate an adult Water Watcher to monitor the pool area at all times. Take turns and make sure the Water Watcher is not interrupted while they are on duty. Fun tip: Have the children help you make a macaroni necklace that is to be worn by the Water Watcher at all times. Then the children know not to distract them as well! Everyone should be involved in a water safety program! Keep constant visual contact with children near water. If you discover that a child is missing, check the water first. Every second counts if they must be rescued or resuscitated. Flotation devices should never be used as a substitute for adult supervision. Drowning is silent. Children can slip under the water without ever making a sound. Keep toys out of the pool when they’re not being used. They can attract children. Even if your children know how to swim, always maintain constant adult supervision when children are in, on, or around the water. 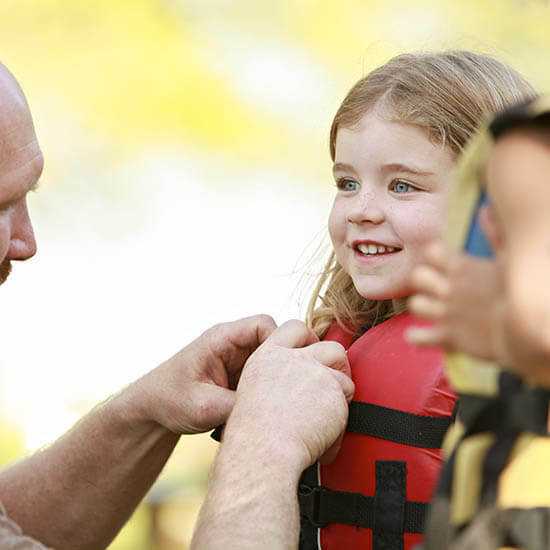 This is also important for children who may be wearing life jackets. Emergency response techniques save lives. Learn first aid and cardiopulmonary resuscitation (CPR). Keep a phone out by the pool at all times. Post CPR instructions by your pool or spa. Keep rescue equipment and a first aid kit poolside or by your spa. A safer experience around water starts with feeling confident about your ability to swim. We believe it’s so important that it is a part of our mission statement. WE TEACH LIFESAVING SKILLS AND SO MUCH MORE! It is a necessary life skill and an important part of any water safety program. Let’s all work on keeping our children SAFER around the water. If you're ready to join the mission, find a class and register your child for a 2-week Everyday Session. You can find more information and prices in our Prices section.